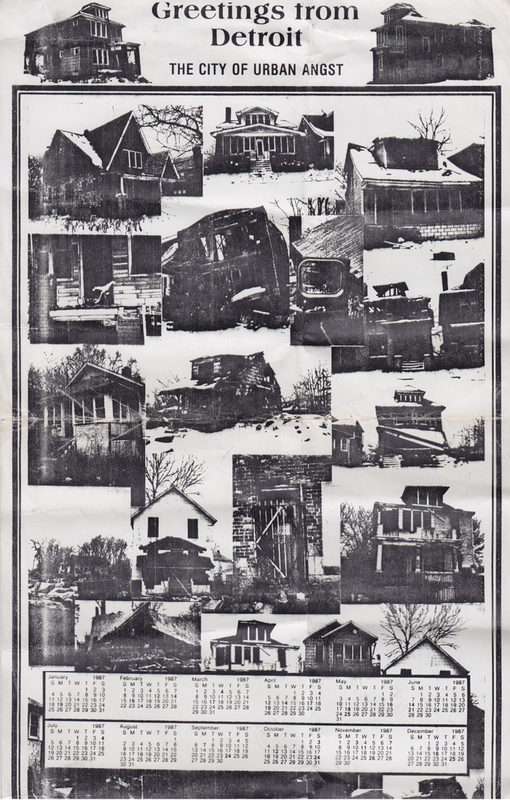 I spent some time sitting in John King Books the other day, talking with Scott Hocking and thumbing through boxes of old snapshots and Detroit ephemera when I happened across this photocopied 1987 calendar with a collage of collapsing and dilapidated houses that looked like something somebody could have made last week after driving down any residential street in the city. There is something about this humble Detroit house architecture that is so distinct, particularly because it is so often photographed in this charred, collapsing state. This calendar was made more than two decades ago and looks as though it could have been made yesterday. There are undoubtedly vacant lots today where these houses stood crumbling in 1986, and there will be vacant lots in twenty years where all the crumbling houses stand today. That is how a city disappears, and this little token reminds us that nothing has stopped it from happening over the last 23 years. With his own money, Monning printed a calendar, called "Greetings from Detroit: the City of Urban Angst," and began selling it this year. It is full of pictures of dilapidated and abandoned houses in his eastside Detroit neighborhood. The 42-year-old bookstore owner says he was tired of listening to suburban friends, who had not visited Detroit in years, accuse him of being down on the city. He also was galled, he says, by a calendar published last year that was filled with only lovely pictures of Detroit. "This is the view I see daily, that my neighbors see, and what the children see on their way to school," he says, holding up his calendar, which he sells for $1. All of the profits, he adds, go to buying security items for his elderly neighbors. Since he began selling the calendars, Monning has received a few obscene calls and a steady stream of angry remarks from customers, who wonder why he is pushing such a gloomy vision of their city. But he is undaunted and promises to have his 1988 version ready soon.